Gov. 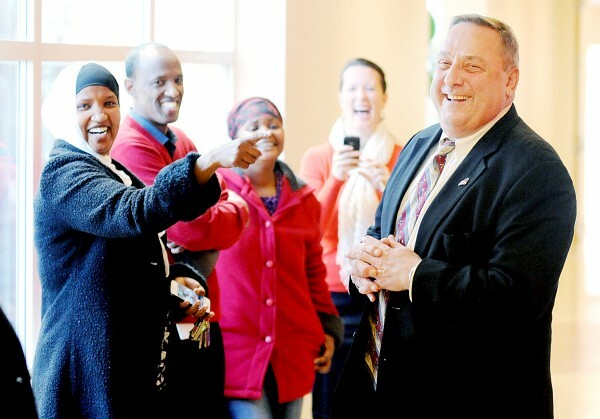 Paul LePage shares a laugh with Fatuma Hussein at the B Street Community Center in Lewiston on Monday. 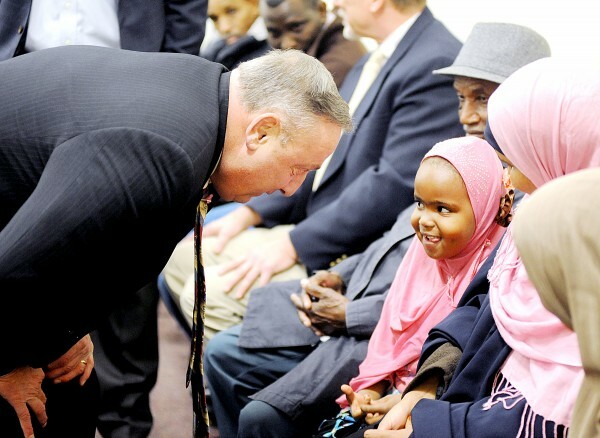 LePage met with local immigrants to hear about the challenges they face in trying to find employment. Learning Works CEO Ethan Strimling, left, and Gov. Paul LePage talk with local immigrants at the B Street Community Center in Lewiston bout the challenges they face in trying to find employment. Mouna Ismail and her 4-year-old daughter, Ibtissan Abdi, hidden, has their picture taken with Gov. Paul LePage at the B Street Community Center in Lewiston on Monday. LePage met with local immigrants to hear about the challenges they face in trying to find employment. Lewiston Mayor Bob Macdonald raises his concern that no federal funds have followed immigrants coming to Maine to help them learn English. LEWISTON, Maine — Gov. Paul LePage is kicking in $10,000 for a program meant to help immigrant families gain English skills. In a low-key visit to Lewiston on Monday, LePage met with some of the families that will benefit from the program being offered by the Portland-based Learning Works. Learning Works CEO Ethan Strimling reminded those in attendance that English was not LePage’s first language either. “My first language is French,” LePage told the group of about 45 men, women and a handful of small children from Lewiston’s immigrant community. LePage said he simply wanted to meet with some of the families and hear from them in person about the challenges they face in accessing the work force. 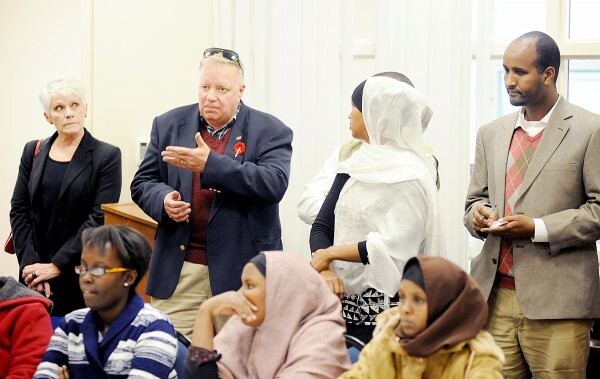 For most, it is acquiring adequate English skills, according to Fatuma Hussein, executive director of United Somali Women of Maine. 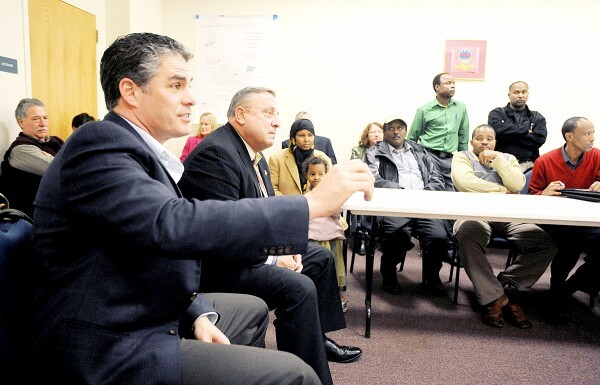 Hussein and other local leaders in the community were on hand to speak to LePage, who listened and exchanged ideas with the group for about 40 minutes. LePage also invited several of the immigrants with whom he had private conversations, some in French, to come to Augusta some time after the holiday season to further explore what state government can do to help. LePage said he was impressed with the quality of the French spoken, but also that many who were in attendance spoke more than one language; it was just acquiring English that presented difficulties for some. LePage’s donation, from the governor’s contingency fund, brings total funding for the program to $50,000 and enough to help about 30 families and between 60 and 80 individuals, Strimling said. Strimling, a former Democratic state lawmaker and BDN blogger, said he was pleased that LePage, a Republican, was willing to check all politics at the door when it came to helping Maine’s growing immigrant population. Learning Works announced the new program in October. It is funded in part by Wal-Mart and the Hudson Foundation and is a partnership between the private nonprofit organization and the Lewiston Housing Authority. The program also helps bridge the gap between English learning in public schools for children by making sure the adults in their life are also acquiring English, Strimling said. Lewiston Mayor Bob Macdonald was also in attendance Monday. He said he and Strimling first started working on an English program for immigrants several months ago. Macdonald said he was pleased LePage came to the city. Macdonald also said the LePage and the state government seemed to be willing to help, but he couldn’t say the same thing about the federal government. Macdonald said he was also glad to hear LePage say he was interested in helping immigrants as they look to develop their own small businesses. He echoed LePage’s comments that immigrants want to work. “But they can’t work if they aren’t speaking English,” Macdonald said. He also said there needed to be a faster way to get immigrants with higher training and education into the professional workforce. Macdonald said he looking for sources outside state and federal government to find resources to help immigrants launch businesses or improve on the businesses they have. LePage said he needed more specifics on the types of businesses immigrants wanted to create, but he would work within the state agencies under his control to help that effort as well.